Hey guys, zamorak here. My server "STALKERs" is hosted by mc pro hosting. Honestly, cheapest servers out there, with more RAM than most hosters offer! Got ripped off by redstone hosting and all the others, paid $10 here and i got 15 slots erver no lag at all. The website is easy to use and manage. Dont know how to work permissions or other plugins? Just ask these guys nicely to do it for you. Ive never had better service, honestly these guys rock. Its like meeting someone that instantly becomes your best friend. No lag, easy to use, nice staff, and cheap honestly why would you not buy from these guys? I play on this server called Peasent.org it’s a Good server I bet everyone on there has not lag infact all of them don’t have lag even people in the uk and Canada. Best Hosting People I’ve Meet I recommend them if your starting a server. Great Hosting, never lags, and is like 100% uptime!! What makes this the best has to be the cheap prices. I SUGGEST THIS TO EVERYONE THAT WANTS TO START A MINCRAFT SERVER! Why I would love to have a free server: I currently run "EdCraft" off my own PC at home although my network is terrible and it lags when I get more than like 3 people at once. I would only need like 15-25 slots and I already have all the files set up. If we got a free server it would be appreciated by both me and the current players on our server. I would love to have a free MC Pro Server. I have always wanted to create a public server and this would be the best way for me to get started in running a server. I hope I get a free server. Why i should get a free server: I Run a minecraft server already but lags with 3 people on, i have been wanting a 24/7 server for ages (even if its just 6 slots!) to have fun on and play with my friends, i tryed to get 5 people on my current server (which im deleting due to lag) that was disaster. So i would be SO thankful if i could get a free minecraft 24/7 server. EDIT: If you give me this It will higher the chances of me buying the stone plan. We will think about it, but we really need more info about your server. You have some awesome special offers. 1 is a free server, telling you why we should get a server hosted for free. There are a few reasons why I should get the free server. 1 reason why is because I'm going to make a server that, I believe, will get really popular. I'm dedicated and the majority of the donations would go to help the server to make it bigger and better. 10+ cod maps on each world with a few pre-chosen classes. It would have a weapon mod or 2 and possibly even a world for people who love nazi zombies. ~I have many ideas for this server and would absolutely love having it hosted for free. P.S. I don't talk to the guy who convinced me to switch host before, it was my former co-owners mistake. 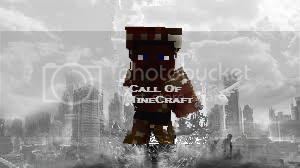 This is a great Minecraft server hosting provider. We have 100% up-time and almost never lags. We can even see how much RAM we are using. MCProHosting is the roots for an awesome server. I'm trying to start a server for my band/marching band at school. It would be great for all the people to be able to play together, and my band director even said that he would play it with us! However, I'm not sure I could get the funds together. If you could consider giving us a free server, it would be AWESOME! why i should get a free server. #1 i cant host my own for my pc wont run the server jar. #3 im a nice guy and would never complain with what you give me. I can tell you more about it but what do you want to know? We don't host for free unless people have a good reason. And this doesn't mean I just want a free server. Can you help us at all? Telling your friends? Advertisement? Banner? Also know that I have said those please don't go and list the same things. Get creative, think of something that you can do. Is it just me or is the "Obsidian plan" 4.99$. If so, i might need to look into this. Hey there, we contacted you via E-Mail and you're set! 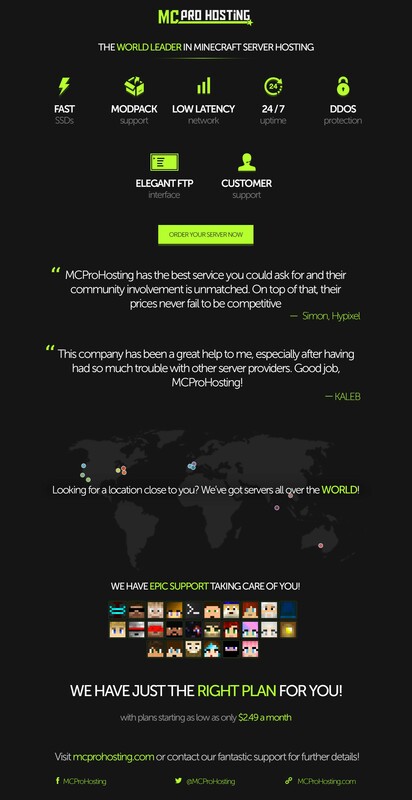 Thanks for ordering from MC Pro Hosting. Thanks for the Review we hope your server continues to grow. How many subs/views does he have? We have many big youtubers already. And I don't mean 50-100 I'm talking around 10000s of subs.